We live in a time of bitter custody disputes, paternity testing, parental alienation, absent parents, custodial and non-custodial parents, visitation and co-parenting agreements…and the list goes on and on. Many who are involved personally in these situations forget to actually consider their children’s needs. They become secondary to their parents’ desire to prove others “wrong” and themselves “right.” This happens in cases when a child is already born and when a child is still in the womb. 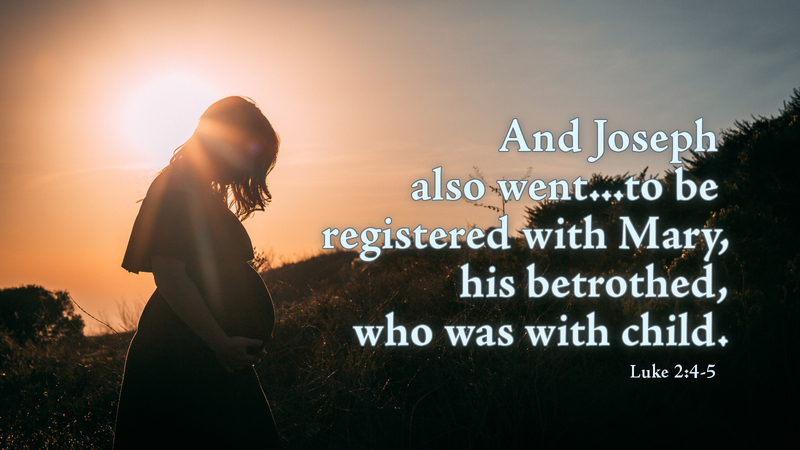 In this passage, and its parallel passage in Matthew chapter 1, we learn of Joseph’s dilemma: his betrothed, his promised wife, is with child — and the child isn’t his! Nevertheless, Joseph is an honorable and righteous man who seeks to protect Mary from societal shame. He doesn’t want to publicly humiliate her and instead, decides to divorce her quietly. In reality, he fails to trust the woman whom he loves. It takes an angel of the Lord to come directly to him and explain the situation. This angelic revelation was the “paternity test” because it proved to Joseph that Mary had not been unfaithful to him. After God’s plan is fully revealed, we see Joseph taking charge as the true, spiritual leader of his household. He seeks to pay the family’s census tax as the law requires in Bethlehem, and when times get tough, as we see when Joseph cannot find a room in the middle of winter, he stays with his family, finds them temporary shelter, and is present at Jesus’ birth. Joseph serves as a model “stepfather for the Lord,” one who loves, cherishes, and serves his family, even in difficult times. This passage demonstrates that all life is God’s. Humans are merely the carriers of life and we are entrusted by God the Father with children to raise, nurture, and foster. We might be entrusted with biological children or with adopted children, with Sunday School children or catechism students, with neighborhood children or with nieces and nephews, but all come from God to us. God calls on us, his Josephs, to provide for the care of some, to arrange for the care of others, and to support all the other Josephs around us — with prayers, with our voices, and with offers of help and support. Let us trust in the Lord and listen to His angel as we march for life this year. Prayer: God, creator of all life, help us trust in Your Word and grant us the courage to care for life — all life. Assure us that the paternity of all God’s children is already established and assist us in providing all Josephs with love and support. In the name of Jesus, Amen. Pro-life Action: Take a look at the ministries in your congregation that involve children. Are there men volunteering there? Often, women outnumber men in these areas. Children need male role models to guide them as disciples of Christ. Encourage men in your congregation to help in these areas. Today’s devotion was written by Rebecka V. Andrae, Administrative Assistant for the Mid-Northeast Mission District. She resides in Greensburg, PA, and is a disciple of Christ worshiping at St. Paul Evangelical Lutheran Church, Latrobe, PA.